A 40-year-old motorcycle, an even older rider, and one of those dreams that never die. 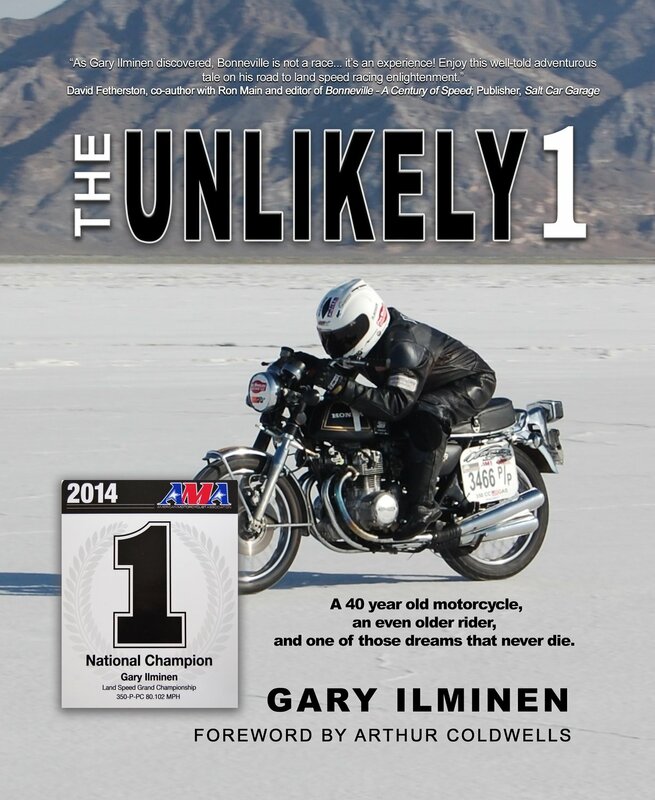 As a teenager, Gary Ilminen read about the motorcycle land speed record-setters that made history on the vast salt flats of Bonneville. For more than four decades, the dream of competing at Bonneville on a motorcycle was set aside, almost forgotten. Then came the chance to compete at Bonneville in 2009; three more trips there ensued and in 2014, the dream of setting a National speed record came true! —Peter Egan, writer for Cycle World magazine since 1978 and columnist for Road & Track. Egan is the author and co-author of a dozen books including Leanings, Leanings 2 and Leanings 3 and the Side Glances series of books. —Andy Goldfine, Founder of Aero Design & Manufacturing, Inc., maker of Aerostich motorcycle riding gear (www.aerostich.com ), creator of “Ride Your Motorcycle to Work” day. "Ilminen brings us into the soul of land speed racing... through the heart and eyes of a passionate small privateer looking not for media glory, but for personal achievement. It is a story that will not only inspire enthusiast, but will guide them through the methodical process of achieving their dream." —David Fetherston, co-author with Ron Main and editor of Bonneville-A Century of Speed.